I know you're thinking that I must have some kind of weird obsession with 'velvet' desserts. This is my second velvet dessert in 2 weeks. 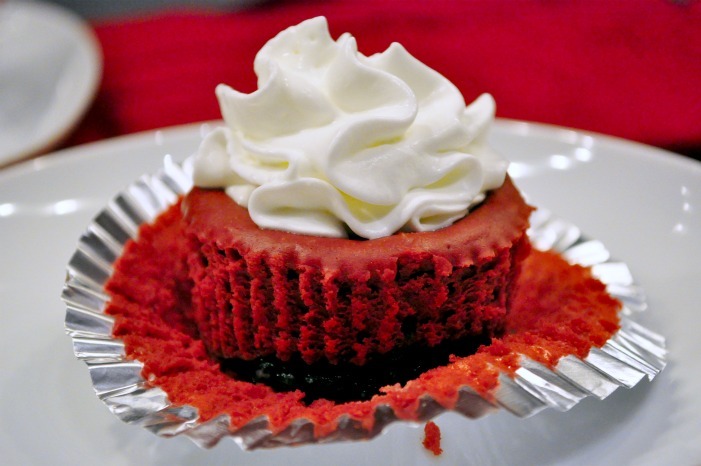 It's almost Valentine's Day, though, and I couldn't possibly let it go by without a sweet little red dessert to share. But back to dessert. I made little cheesecakes. Isn't it pretty? I am obsessed with that deep red color. Oh and the whipped cream. I really love whipped cream. And they aren't just any little cheesecakes. Nope. These have a whole Oreo on the bottom, white chocolate chips throughout, and a gorgeous red velvet color. They are rich, sweet and a perfect dessert for any day really. That's why I made them into individual servings...so you can have a treat anytime without feeling like you are eating a decadent slice of cheesecake. Ya know? And I almost forgot to mention that these little guys clock in at 4 Weight Watchers Points+ per cheesecake. Not too shabby if you ask me. Preheat oven to 350 degrees. Line two muffin tins with foil baking cups and drop an Oreo cookie in the bottom of each. Meanwhile, beat the cream cheese in a stand mixer or with a hand mixer. Beat in the sugar and cocoa on medium speed until light and fluffy. Pour in vanilla and food coloring; beat to combine well. Add eggs, one at a time, and mix thoroughly. Make sure you scrape down the bowl, turn over the ingredients that have sunk to the bottom. You want to make sure it's all gorgeously red and not lumpy. Add white chocolate chips and stir until combined. Pour batter into baking cups, filling them about 2/3 of the way full. Bake 20 minutes or until centers are firm. Cool for 10 minutes in baking pan. Remove cups from pan and refrigerate for 2 hours before serving. Store in an airtight container for up to a week, or freeze for future use! Serve with 2 Tbsp whipped cream per cheesecake. I really love these! I think they just turned out so pretty and were fairly easy to make. I definitely set a couple aside for Valentine's Day. I love that they are already in individual servings, so there's no temptation to go overboard. Each of us gets one, and end it there. It's my kind of dessert. Are you into Valentine's Day? If so, what are you doing for it? Do you like individually portioned desserts?